Here’s a lesson in self-love: Monkeys love themselves so much that they perk up when watching programming featuring monkeys, according to a new study. Whatever the monkey movie, chances are a monkey will enjoy watching it. Planet of the Apes. King Kong. Curious George. Space Chimps. Beneath the Planet of the Apes. Escape from the Planet of Apes. Dawn of the Planet of the Apes. Researchers at Kyoto University showed six bonobos and six chimpanzees a pair of short films that featured humans dressed in ape costumes performing scary acts. In one film, the actor bursts through one of two identical doors, while in the other film, an actor attacks the person in the ape costume with one of two objects. Uh, why didn’t the researchers show any of the above-mentioned movies that feature actual monkeys, though?? 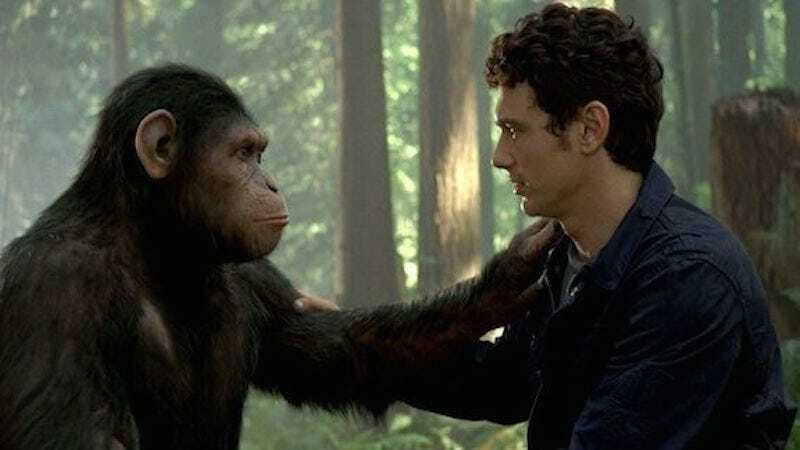 Twenty-four hours later, when the animals watched the same movie again, analysis of their eye movements showed they anticipated the “ape” coming out the correct door, and also looked at the right weapon before it was used to attack the ape. There’s a moral here. Monkeys love themselves, and so should you.